Blown off course by strong winds and currents for several days, the Bishop of Panama, Fray Tomás de Berlanga, sighted an island. Running low on provisions, he and the rest of his crew disembarked to search for fruits and water, but disappointment was soon upon them. In a letter to His Majesty describing the voyage, Fray Berlanga reported of seeing “nothing but seals, turtles and such big tortoises that each could carry a man on top of himself.” In 1570, 35 years after their discovery, the Islands were officially named by Flemish cartographer Abraham Oretlius, who referred to them as “Insulae de los Galopegos” or “Islands of the Tortoise”. Today, we know them as the Galapagos Islands and the giant tortoises which still roam upon them have become a true icon of the Archipelago. How such large and seemingly lethargic reptiles reached a chain of volcanic islands 1,000 kilometres west of Ecuador has long been debated. Some believed that the Islands must once have been connected to mainland South America and that the tortoises simply walked there. We now know that the Islands were formed as a result of a hotspot in Earth’s crust and that the ocean between Galapagos and the mainland is at least 3 kilometres deep in places, so there is no way that this could have been the case. Another theory is that the tortoises swam to the Islands. This may seem ludicrous given that they can weigh up to 400 kilograms, but is actually not far from the truth. In 1923 the naturalist William Beebe attempted to dispel the idea that tortoises swam to the Galapagos Islands by testing their sea-worthiness. Upon heaving one over the side of his boat he was astonished to find that the tortoise “floated buoyantly”, its head and neck rose above the water and the top of its shell bobbed up and down on the surface. Additional credibility can be given to the theory by the fact that giant tortoises can survive for sustained periods of time without food or fresh water. Also, as Fray Berlanga experienced, the currents along the South American coast can be very strong, moving in a westerly direction towards the archipelago. These three features support the now widely held belief that at some point a giant tortoise, perhaps a pregnant female, was washed out into the ocean from the mainland and, having been at the mercy of the currents for a number of days, struck lucky by finding one of the islands in Galapagos. Whatever their mode of arrival to the Archipelago, one thing that is certain about giant tortoises is that they were able to adapt to island conditions and became an important part of the ecosystem. Three hundred years after the islands’ discovery, the HMS Beagle anchored off San Cristóbal, one of the eastern islands, and off stepped a young Charles Darwin. In the five weeks that followed he observed things that led him to formulate his theory of evolution. One such observation was that “several of the islands possess their own peculiar species of tortoise.” It is now known that at least 14 species of giant tortoise once lived on nine of the islands, differing primarily in size and shell shape. 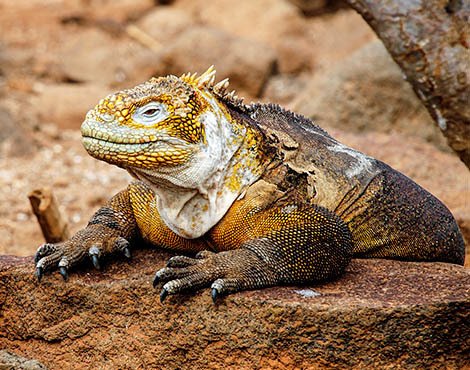 Today, only ten species living on six islands remain: one on each of San Cristóbal, Española, Santa Cruz, Pinzón and Santiago, and five on Isabela, the largest island in Galapagos. Unfortunately, giant tortoises have been under threat almost since the day they were discovered. 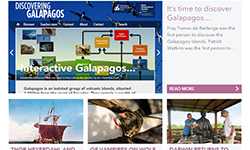 No sooner had the Galapagos Islands been put on the map than word got out of their abundant, slow-moving and apparently flavoursome residents. The British Royal Navy Officer James Colnett played a relatively key role in their early exploitation. Visiting the archipelago in 1792 when seeking new whaling territory, he wrote that the giant tortoise “was considered by all of us as the most delicious food we had ever tasted.” Not only this, he also found the islands to be a particularly good site for whaling, leading to the development of an industry which remained in the area until the end of the 19th century. During this time, an estimated 200,000 giant tortoises were removed from Galapagos. Their ability to be able to survive for long periods without food or water, one of the characteristics that led to them initially colonising the islands became their downfall. Pirates and whalers would load giant tortoises into their ships’ holds, providing them with a supply of fresh meat even on the longest of journeys. David Porter, an officer on-board the USS Essex, was said to have loaded his ship with 14 tons of tortoises in just four days. It has long been believed that whalers and pirates have historically had the largest impact on the decline of the Galapagos giant tortoise, however, a remarkable discovery was made in 2015 by Cyler Conrad, a PhD student from New Mexico. Conrad’s research on the gold-rush era during the 1840s and 50s in California, found that like the whalers before them, the Gold Rush Argonauts also found Galapagos tortoises and sea turtles easy to capture, high in number, and enormously tasty. During the Gold Rush years San Francisco’s population swelled from 800 to nearly 20,000 people, and while several routes existed for heading to the gold fields, travel by ocean was by far the most popular. Typical ocean routes brought passengers to the Galapagos Islands. As vessels passed the Islands headed north, they would stop, pick up large numbers of tortoises, and consume them either on their voyage or upon arrival in California. The tortoises sold for enormous prices after arriving in San Francisco. After adjusting for inflation, seventeen tortoises that arrived in 1849 were sold for more than 50,000 dollars. Whilst it is unlikely that the absolute numbers of tortoises imported into the San Francisco Bay from Galapagos will ever be known, the existing evidence shows the numbers would have been significant. At the same time as the extraction by whalers was occurring in the 19th century, early human settlement of the islands began, bringing with it further threats to giant tortoises. Habitats were cleared to make space for houses and agriculture, and various mammals such as goats, pigs, rats, cats and dogs were introduced. Of these, goats have probably caused the most detrimental impact on giant tortoises. Left to roam free on some of the smaller islands, goat populations soon exploded and as generalist herbivores they devastated the natural ecosystem, turning once pristine forest into barren grasslands. In 1959, two organisations were formed which were to prove fundamental to the conservation of giant tortoises: the Galapagos National Park Service (GNPS) and the Charles Darwin Foundation (CDF). The establishment of the Galapagos National Park resulted in 97% of the land area of Galapagos legally protected as Ecuador’s first national park. In order to provide a scientific basis for management decisions made by the GNPS, CDF was created and the Charles Darwin Research Station (CDRS) was established on Santa Cruz. 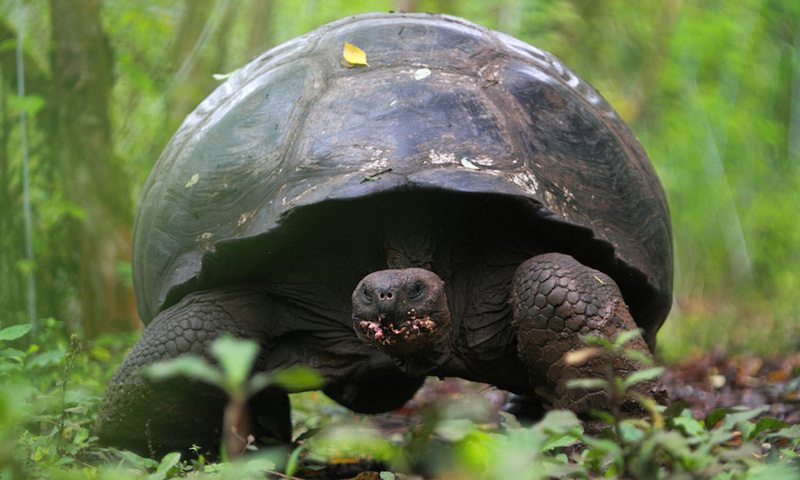 In 1965, following five years of research into the status of reptile populations, CDF confirmed that of the 14 Galapagos giant tortoise species, three were already extinct and several others were at critically low levels. A giant tortoise breeding and repatriation programme was started in an attempt to revive dwindling populations, a project still running today. Fortunately, it has had many successes, the most notable of which concerns the Española tortoise. By 1974, CDF had collected all remaining tortoises from Española and taken them to the breeding centre on Santa Cruz. They numbered just 14 wild individuals. An additional male of the species was located at San Diego Zoo and brought back to the islands where CDF began a long captive breeding process. Since then, goats have been completely eradicated from Española and over 1,750 tortoises have been repatriated to the island. A survey carried out in 2007 confirmed that they are once more breeding successfully in the wild. Not all species have been quite as lucky. 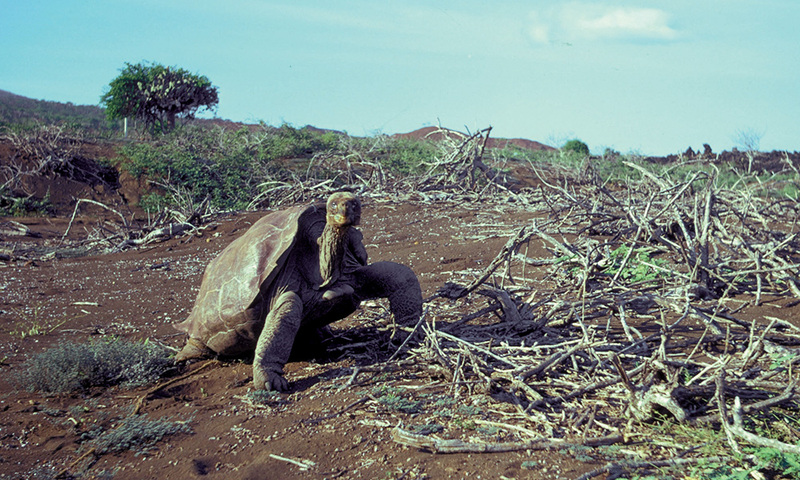 In 1971, the GNPS and CDF located a male tortoise on Pinta which belonged to a species previously believed to be extinct. He was named Lonesome George and was relocated to the CDRS, later becoming the most famous giant tortoise in the world. For 40 years attempts were made to try to locate a female Pinta tortoise to no avail. Captive breeding attempts with the most closely related giant tortoise species yielded similarly unsuccessful results. On 24 June 2012, Lonesome George passed away, taking with him all hopes to save the Pinta tortoise. Or did he? Just six months after George’s death, scientists conducting genetic analysis of tortoises on Wolf Volcano in northern Isabela reported that they had found hybrid tortoises with Pinta ancestry. Seventeen individuals were found in total, four of which likely had a parent that was a purebred Pinta tortoise. Ironically, the likely explanation for this could be linked to their original demise. Northern Isabela was an important docking area for whalers, and surplus tortoises that had been collected from other islands were likely abandoned here. This exciting discovery has reinvigorated the search for purebred Pintas and, if successful, could lead to native tortoises roaming the islands once more. In addition to breeding programmes, much effort has gone into the eradication of invasive species. In 2006 Project Isabela was successfully completed after almost a decade. The project saw the complete removal of feral goats from Pinta, Santiago and the northern portion of Isabela, at a cost of more than US$10 million. It was the largest and most successful eradication project in the world and the methods developed during it have since been applied to other island nations including New Zealand and Hawaii. To complement the captive breeding and invasive species eradication initiatives, scientists are conducting important research into giant tortoise ecology. One such project, the Giant Tortoise Movement Ecology Programme, is conducting pioneering research into tortoise migration in Galapagos. 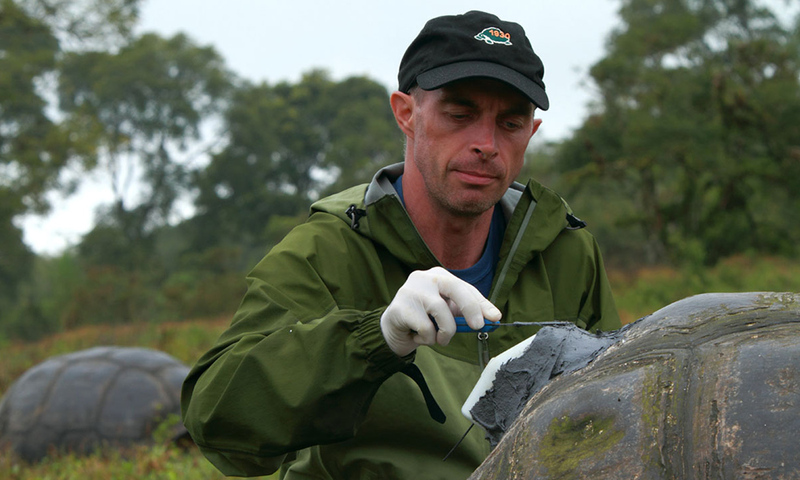 Dr Stephen Blake, coordinator of the project, admits that “despite their iconic status and international renown we know very little about the ecology of giant tortoises.” The project aims to answer important questions relating to the ecological role played by tortoises, their migratory behaviour and their spatial needs, and has already greatly improved our understanding of this key species in Galapagos.